Chances are, one of your resolutions for the New Year involved getting more fit. Well, forget the gym – hiking is a great way to stay in shape, not to mention see new sights and enjoy the out-of-doors. You can find plenty of great trails right in the city and nearby. 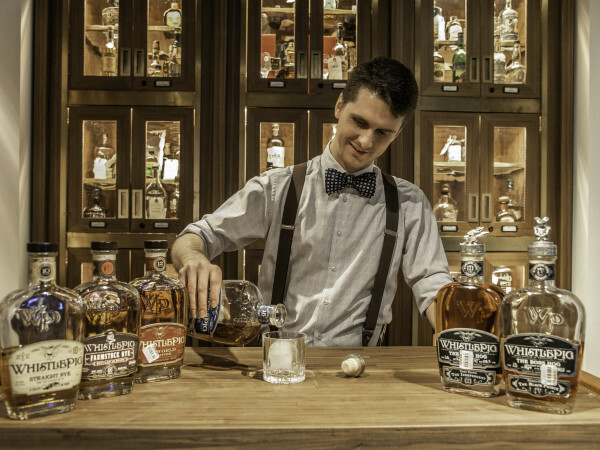 Here are eight of the best. 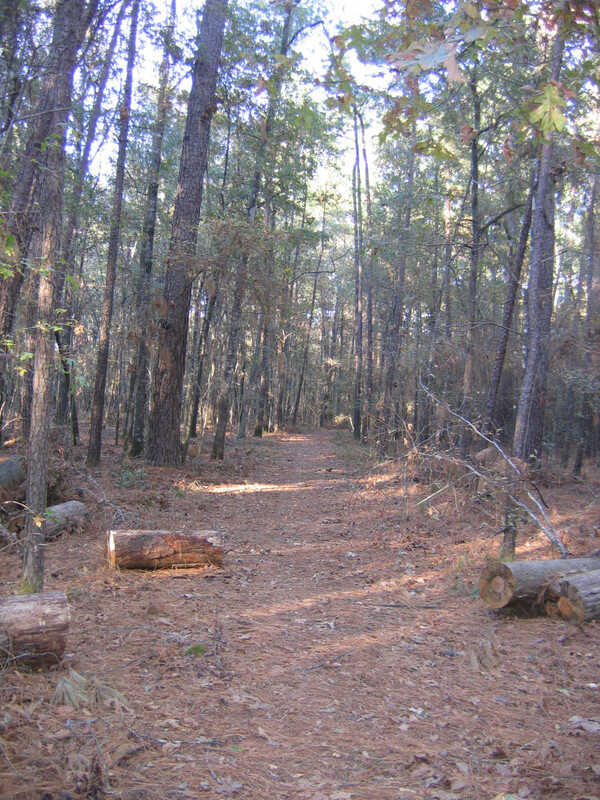 The outer loop in a network of trails, this route circles through woods of loblolly pine, cypress, hawthorn, elm, yaupon holly and a variety of oaks, along with lichens, mushrooms, colorful American beautyberry and other native plants. It crosses or follows several small creeks. The hike begins and ends at a parking area with restrooms and water. Open dawn to dusk, free. 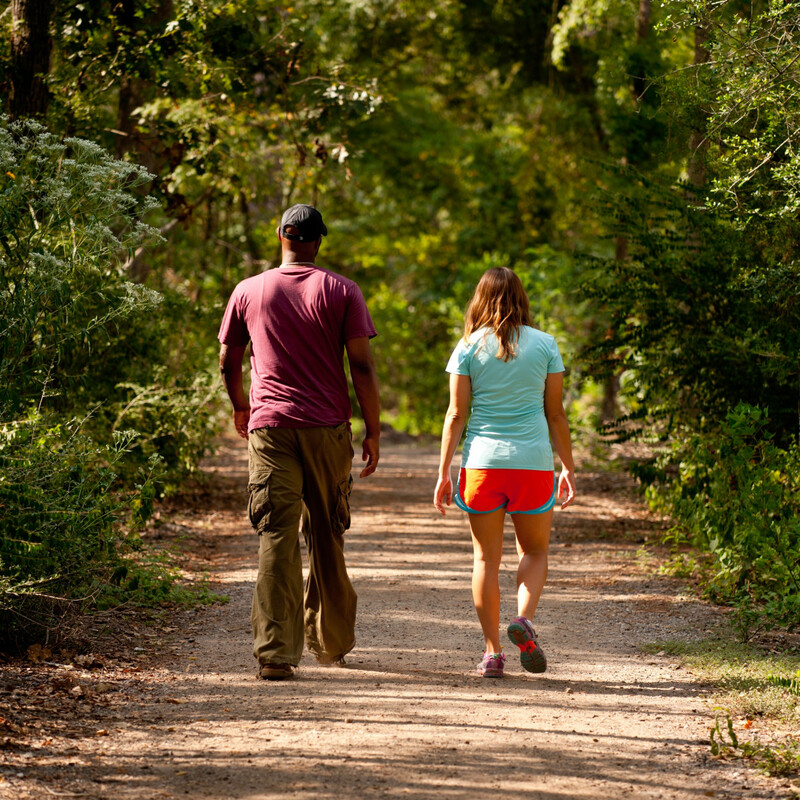 Next door to Memorial Park, the 155-acre Houston Arboretum & Nature Center offers an escape into nature on five miles of trails. This route circles the Arboretum, crossing through edge habitat, which attracts birds and other wildlife. 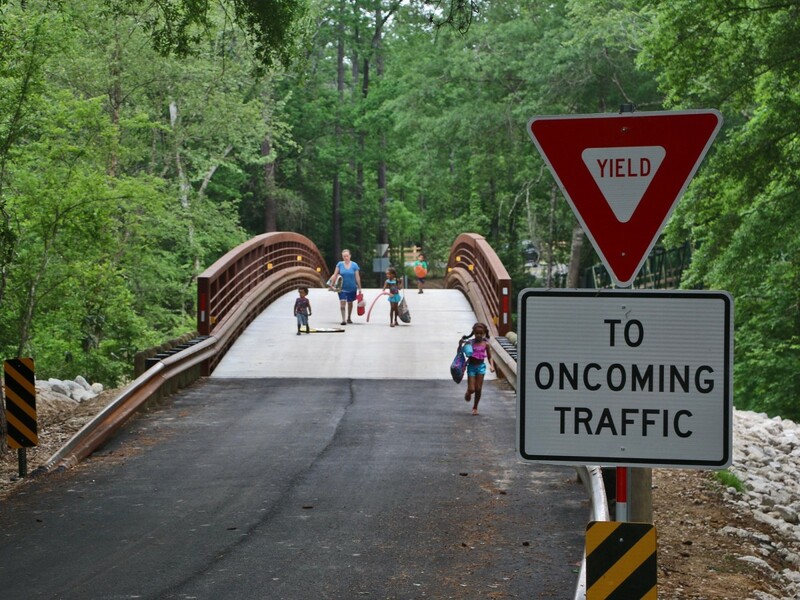 Add a jaunt down the quarter-mile Coggie Pearson trail, which begins on the half-mile Alice Brown Loop, descends a steep ravine and follows an East Texas-style seasonal creek. Some of the largest sycamore trees in Harris County border this trail, which has been revegetated with native Texas plants. The Arboretum also has meadow and pond observation decks. Free and open daily 7 am to 7 pm. 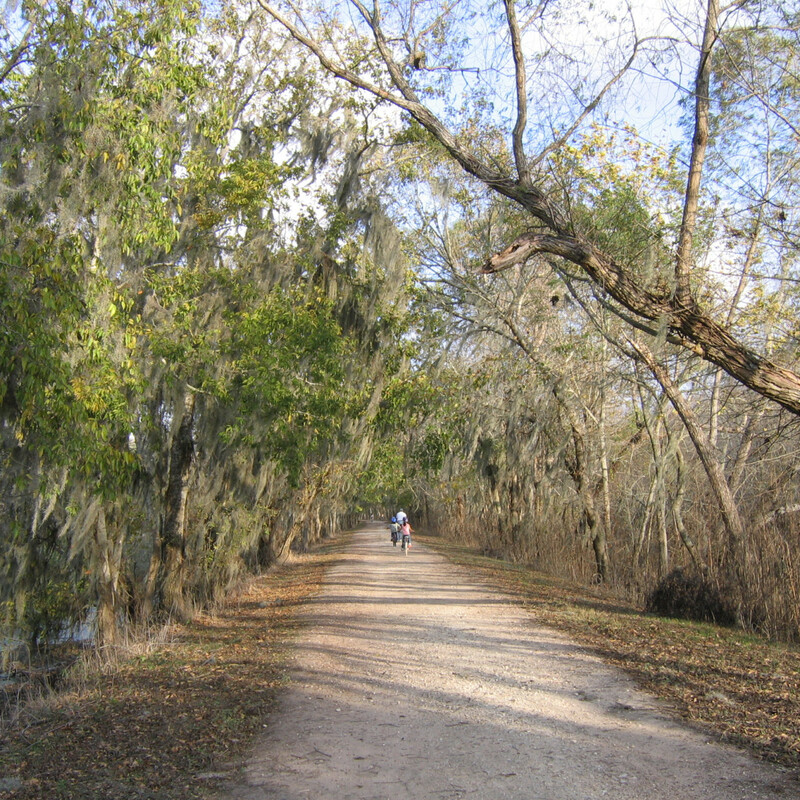 A 4,786 acre park on Peach Creek and the San Jacinto River, Lake Houston Wildnerness Park contains 12 miles of heavily wooded trails. From the bridge across Peach Creek, take the Peach Creek Loop trail and then the Forest Trail to connect with North River Trail. From there, it is an out-and-back hike. You’ll cross a power line right of way then head into tall, pine woods. Keep to the left at several intersections with other trails, over a few wooden bridges before reaching a bench on a bluff above the river. A short trail leads down to the sandy shore, where you may see turtles and frogs. Entry fee $3, open Sunday to Thursday 7 am – 6 pm, Friday and Saturday 7 am – 8 pm. This wooded state park sits on the shore of one of the largest lakes in the state, noted for its fishing. Combine the .95-mile Pineywood Nature Trail and 2.73-mile Livingston Trail for a pleasant hike through woods with view of the lake and, on the nature trail boardwalk, a duck pond, frog pond and butterfly garden. Note that hiking is not allowed on the park’s Equestrian Trail. 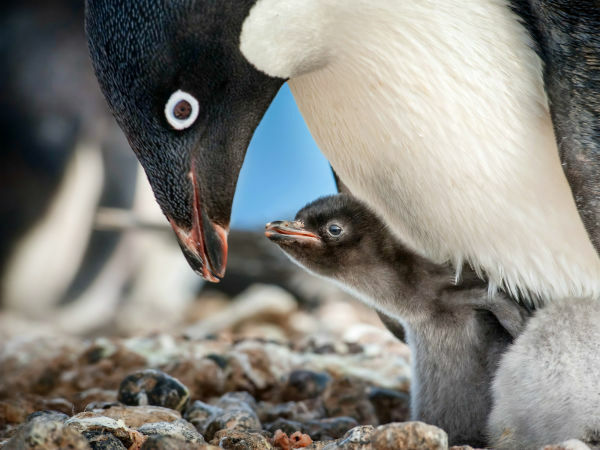 Entry $5 per adult, open daily. This scenic park offers excellent opportunities to see alligators. Start at the nature center parking lot and follow the Pilant Slough Tail through a wooded bottomland then more open woods before it hits Elm Lake Loop. A number of observation decks along this reedy lake make it easy to watch alligators as well as herons, ducks and other birds. Follow the trail to the end of the lake, then continue straight on the Spillway Trail through an arching canopy of trees toward Pilant Lake, which has a three-story observation tower. Continue around 40-Acre Lake – more birds and gators – past restrooms and turn-offs to the Prairie and Hoot’s Hollow Trails. Return the way you came, or, for a change of scenery, turn off on the Live Oak Trail and follow it back to Pliant Slough. Bone up on alligator etiquette before you go. Entrance fee $7 per adult, gates close at 10 pm. 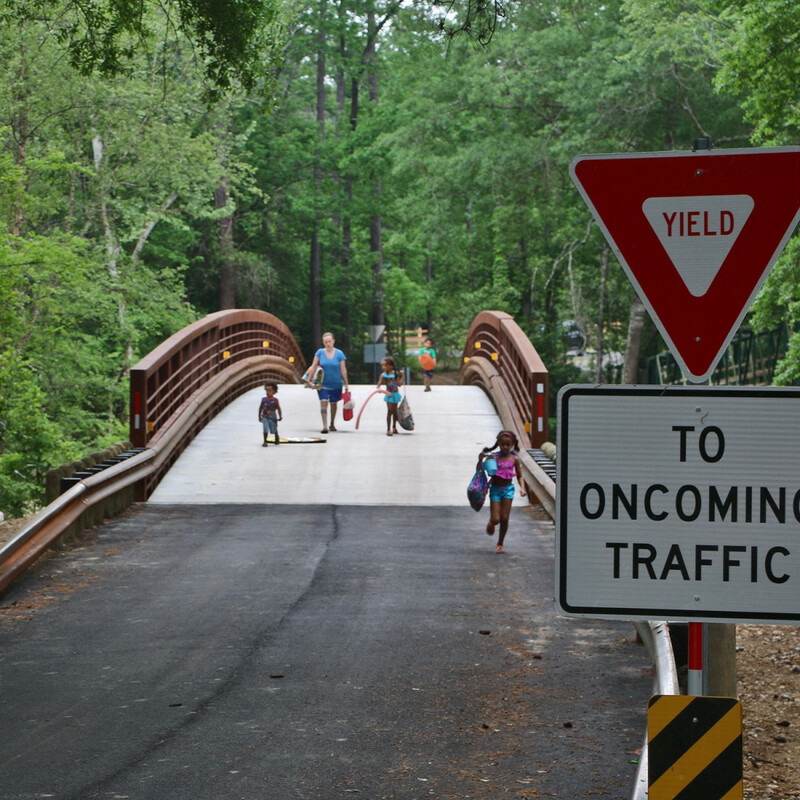 A wide, straight out-and-back shot through the 7,800-acre park, this asphalt trail is also stroller- and scooter-friendly. 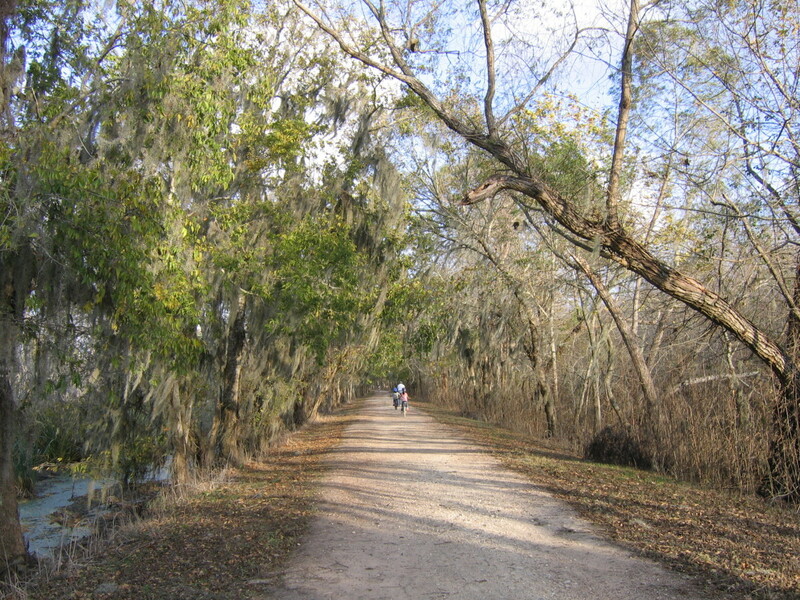 Tall trees line the first mile and a half of the route, and an old bridge crosses Buffalo Bayou about halfway. The second half has trees closer to the path, offering some shade, and benches at regular intervals. A gate at 2.7 miles leads to Harris County Precinct 3 Sports Park in another 0.7 miles, where there are restrooms and water fountains. Retrace your steps from here, unless you left a shuttle car earlier. Free, open 7 am – 10 pm. 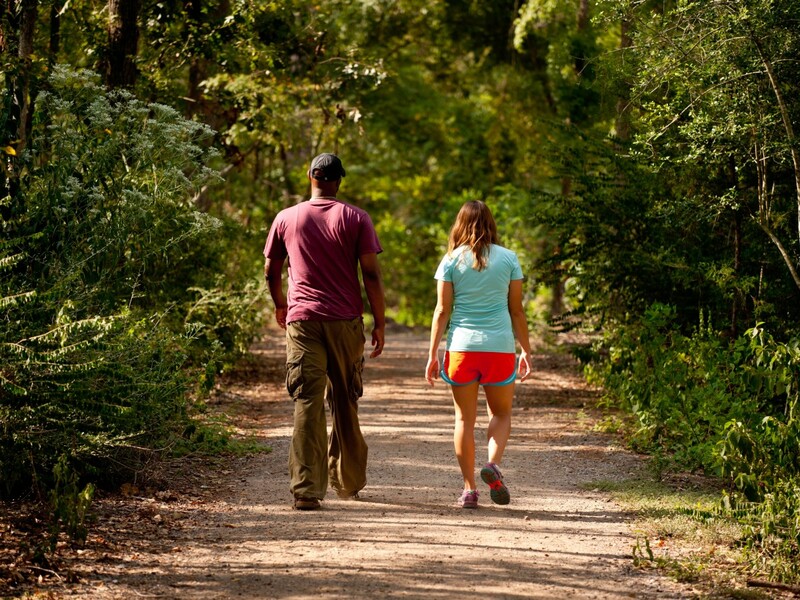 This long, narrow, 500-acre park follows Buffalo Bayou from George Bush Park Hike and Bike Trail to Beltway 8, with hiking trails along its length, including the 1.6-mile Mockingbird Trail from Highway 6 to Eldridge Parkway, and the 5-mile Quail Trail from there to the Tollway. Multiple access points make it possible to choose hikes of various lengths, with parking and water fountains at Highway 6 and Dairy Ashford. The 1.25-mile Blue Jay Trail loop leads north to parking at Memorial Drive and the 0.9-mile Cardinal Trail loop from there to parking at I-10. On 2,500 acres near NASA Johnson Space Center, Armand Bayou Nature Center helps preserve wetlands prairie, forest and marsh habitats surrounding Armand Bayou, one of the last unchanneled bayous in the Houston area. Five miles of hiking trails wind through the woodlands and prairies and along the water; combine the Martyn and Karankawa trails for a three-mile route. The trails parallel each other, the narrow Martyn Trail in deep woods and the Karankawa along the edge of a bayou. Open Wednesday through Saturday from 9 am to 5 pm Sunday from noon to 5 pm. Admission 3 & under free, 4 - 12 years $2, 13 - 59 years $4, 60 & above $2; no dogs. 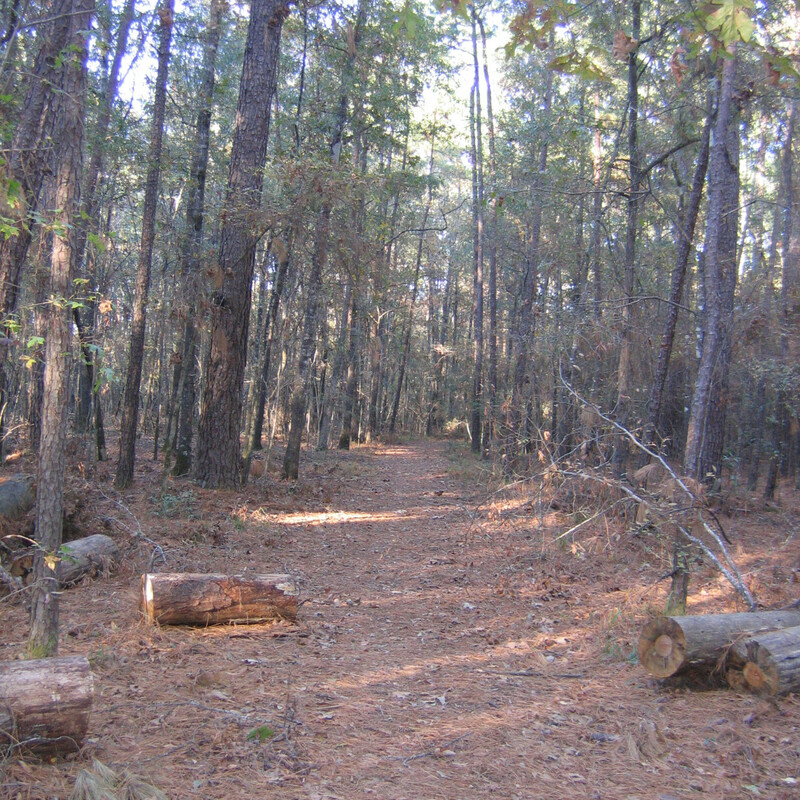 Do you have a favorite hiking trail in the Houston area that we missed? Let us know in the comments section below.